British MPs have rejected leaving the European Union without a deal, paving the way for a vote to delay Brexit to seek a way out of Britain’s worst political crisis in generations. The House of Commons voted 312 to 308 – a majority of four – in favour of a cross-party amendment rejecting a no-deal Brexit. And the vote was later confirmed by a more emphatic 321 votes to 278, overriding a Government motion tabled by Theresa May which would have rejected no-deal on the scheduled date of March 29 but left it on the table for other times. 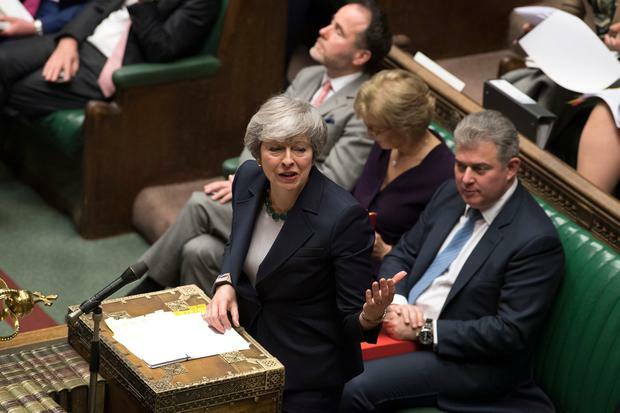 Despite the MPs’ vote to reject a no-deal Brexit, Prime Minister Theresa May told the House of Commons that it remains the default option if no deal was reached. Theresa May said that MPs will vote tomorrow on an extension to Article 50, which could involve a short delay to implement a deal agreed in the next few days or a longer delay if no agreement is reached. “If the House finds a way in the coming days to support a deal, it would allow the government to seek a short, limited, technical extension to Article 50 … Such a short technical extension is only likely to be on offer if we have a deal in place,” Mrs May told parliament. She added that the longer extension would mean Britain would undoubtedly have to take part in European Parliament elections in May. Ahead of Wednesday’s vote, the pound headed for its biggest daily rise in 2019 as investors bet on a vote against a no-deal Brexit. It rose again on the result of the vote. As the United Kingdom’s three-year Brexit crisis spins towards its finale, diplomats and investors see four main options: a delay, May’s deal passing at the last minute, an accidental no-deal exit or another referendum. Britain’s government will propose on Thursday to seek a delay to Brexit until June 30 if parliament approves a deal to leave the European Union by March 20, the parliamentary Speaker said. The government will also say that if no agreement has been approved by parliament by March 20, it is unlikely that the European Union will approve any extension at its summit on March 21-22 without a specific reason to do so. If the deal is passed by March 20 “then the government will seek to agree with the European Union a one-off extension … for a period ending 30 June 2019 for the purpose of passing the necessary EU exit legislation”, the Speaker John Bercow told parliament. A delay will require the agreement of all the bloc’s other 27 members. May’s deal covers such things as citizens’ rights, the status of the Irish border and Britain’s divorce bill from the EU. It takes Britain out of the EU single market and customs union, common fisheries and farm policies and the jurisdiction of the European Court of Justice. It also offers a status-quo transition period in which to negotiate trade arrangements. Under a no-deal exit, there would be no transition period to soften the disruption to trade and regulations. Britain would quit the EU’s 500 million-strong single market and customs union and fall back on World Trade Organisation rules, which could mean tariffs on many imports and exports. Sarah Newton has resigned as a minister at the Department for Work and Pensions over the Brexit vote, a DWP source said. Responding to another chaotic night in Westminster, Taoiseach Leo Varadkar said: “Things are looking a little brighter today than they did yesterday.